Drive Culture Quiz time: What do you know about the Gardiner Expressway? Vehicles travelling on Lakeshore Blvd. East are photographed on June 28, 2018, after passing under the elevated eastern section of the Gardiner Expressway. Toronto’s Gardiner Expressway. To some, it’s a malignant transit tumour that needs removing. To others, it’s a vital artery. Mayoral candidate Jennifer Keesmaat invoked the Gardiner last week. She promised to tear down the Gardiner and replace it with a “grand boulevard.” Incumbent mayor John Tory has championed the $919 million “hybrid” approach [also known as “keeping the Gardiner”]. Keesmaat says her Gardiner gambit would save the city approximately $500-million. 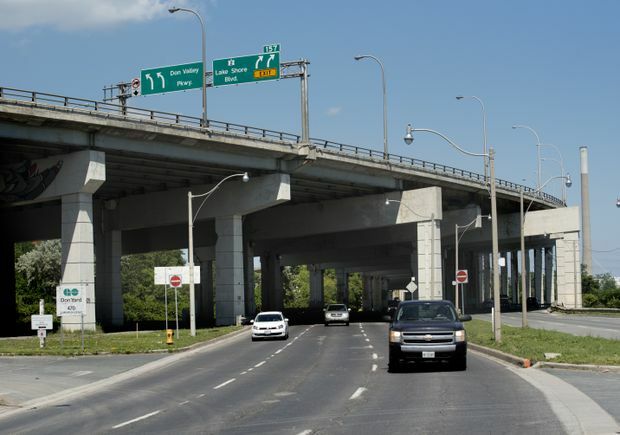 Controversial since the day it opened, the Gardiner and its issues can be confusing – but there’s no need to be stumped this election day, Oct. 22. Take the Road Sage “Gardiner Expressway Quiz” and you’ll be so brimming with knowledge that you’ll be ready to take over as Toronto’s new chief city planner. The Gardiner under construction in 1961. 1) In 1979, Toronto Mayor John Sewell suggested commissioning a study into doing what with the Gardiner between Dowling Avenue and Dufferin Street? a) Covering it with a 40-acre housing development site. c) “Purifying” the Gardiner with a nuclear blast. a) A tearful Frederick G. Gardiner in 1965 shortly after completion of the expressway that bears his name. b) The “Don River Valley Team” in 1989.
c) “Mayor Mel’s Men” in 1999.
d) Singer/songwriter Dan Hill in 1977. 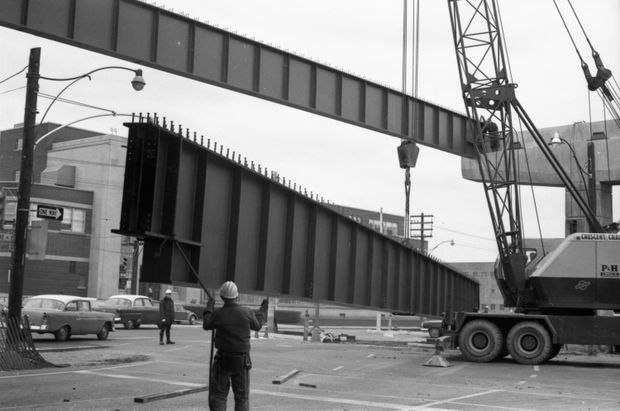 Steel girders are put in place above Jarvis Street on the Gardiner Expressway in downtown Toronto in 1963. 3) In 1989, Toronto developer William Teron and the Four Guys Off the Wall said they could bury the Gardiner and turn it into an underground eight-lane route for $1 billion dollars. What else did they want to do? a) Flood the SkyDome and have Argonauts fight Naumachiae (naval battles). b) Add two more levels to Gardiner. c) Build 10,000 housing units and 5 million square feet of office space. d) Cover the Gardiner with 16.2 hectares of parkland. 4) Which of the following has the Gardiner Expressway been called? a) “Not a beautiful brick, arched aqueduct running through the hills of Tuscany." 5) In December 2012, six months after becoming Toronto’s chief city planner, Jennifer Keesmaat said a study into the Gardiner could come up with which of these potential outcomes? a) Take it down and tunnel. Take it down and just leave that capacity of car traffic. b) Take it down and invest significantly on transit. Leave it up and toll. c) Leave it up and the city pays for it. Leave it up and sell it. d) Inherit it. Marry it. Or forget about it. 6) In 1978, “chunks” of concrete were reported falling off the Gardiner Expressway. “Chunks” have been falling off ever since. What causes this phenomenon? a) The psychic weight of the depression experienced by commuters destabilizes the concrete and it flakes off. b) Water tainted with salt seeps into cracks in the concrete. The steel reinforcing rods rust. The rust has more volume than steel and the expanded rods break up the concrete and more water seeps in. c) It’s an industrial design decision. During the winter, the falling chunks of concrete go nicely with the flying chunks of ice coming off the Gardiner. 7) In 2017, Mayor John Tory wanted to put tolls on the Gardiner and the Don Valley Parkway. Premier Kathleen Wynne nixed the plan. We haven’t heard the “T” word all election. Why not? c) Half the billboards that pitch downtown condos use a “beat the commute” message. e) So, no road tolls. 8) In the year 2025, future Toronto Mayor Pinball Clemens will hire which rock group to play his “Gard-Aid” Fundraiser to save the Expressway? e) None of the above. By 2025, the Gardiner and the surrounding area will have been swallowed by the stormy, angry rising waters of Lake Ontario.